KRALENDIJK - The lifting by the Dutch government of the ban on civil servants to fly with InselAir has - at least in the short term - no consequences for the flight operations of the CN Express. "The agreements on the CN Express have been entered into for a period of three months. We are now halfway. At the beginning it was agreed to hold an interim evaluation after six weeks. This will happen soon," said a spokesman for the Ministry of Infrastructure and Water Management. "It is not yet possible to say whether lifting the flight ban in the long term will affect the CN Express. Of course, this fact does play a role in the final evaluation in which it will be decided whether the CN-Express will continue or not. Incidentally, there are several elements that can play a role, such as the recent announcement by Winair to extend the Sint Maarten-Curaçao route to Aruba or Bonaire as of July 15." Since 26 February, two flights of Air Antilles have been flown directly between Bonaire and St. Eustatius twice a week. 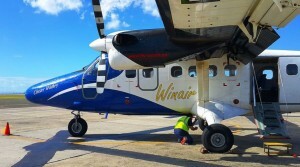 Winair provides the connection to Saba. The Rijksdienst Caribisch Nederland takes from every flight a number of places for medical transportation and employees. In addition, a fixed number of places goes into free sales. A single trip costs 300 USd.